I have previously written about being pleasantly surprised at the cozy restaurant Ship Inn, located in the middle of the Culture Park in Konyaalti. Here we got a steak a couple of years ago, which was surprisingly good and really delicious. But it is a common but very cozy restaurant. My husband and I get (a little too often) ideas about all sorts of things – what could be develop, build, should, could, would, if only we had the time and money. 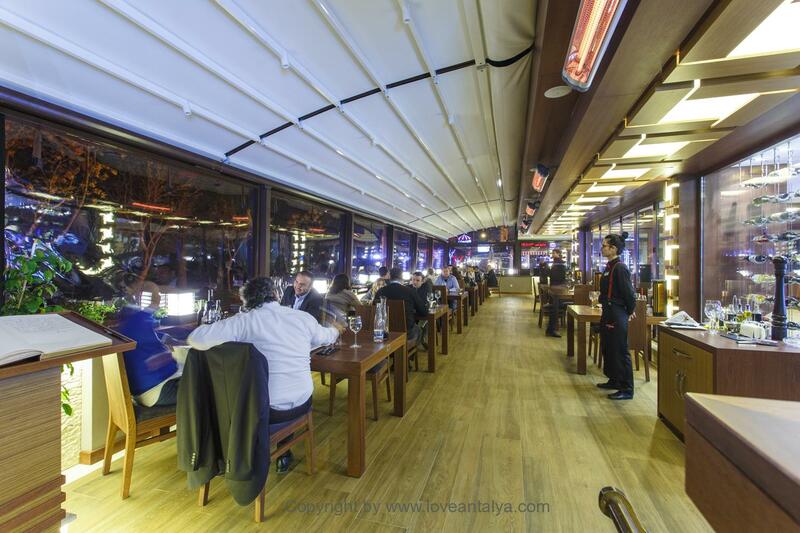 One of the ideas has always been, that we should start a proper steak house up in Antalya – such a real one with hot plates, good grilled steaks of all kinds, sidedishes, sauces and wine and whatever you can imagine. 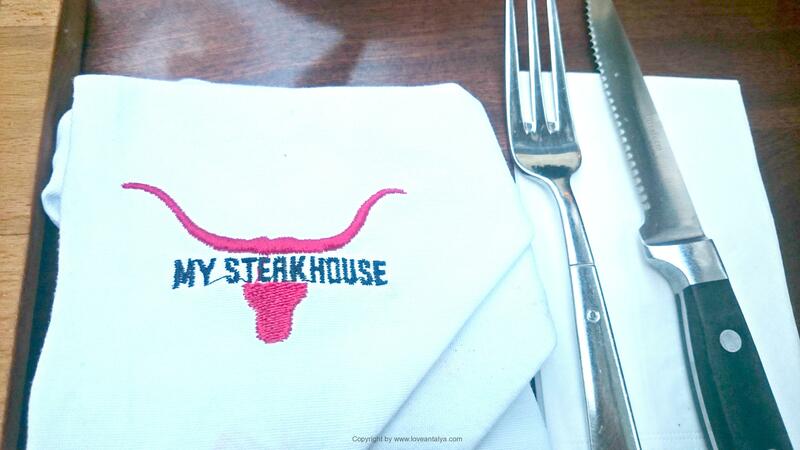 This Steak house comes very close to our dream !! 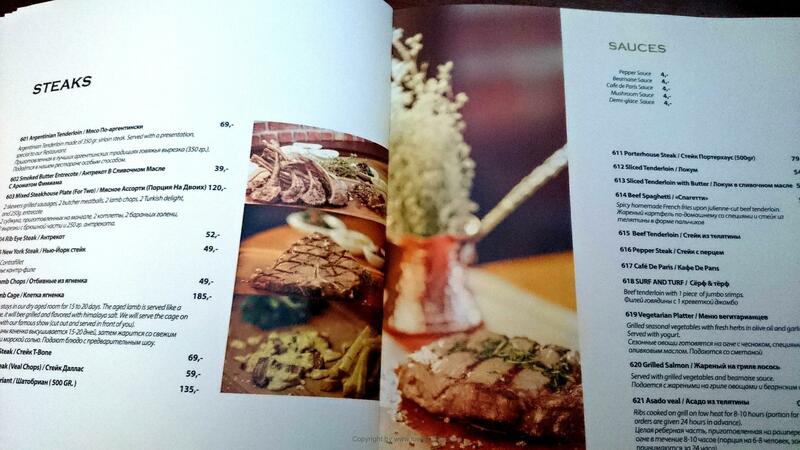 In fact it is the best steakhouse we have yet found in Antalya. And with an incredibly good and varied menu too. It is located in a very cozy and nice neighborhood next to the old road from Antalya city and towards Lara Beach. And it has a decor, that is far beyond what many other restaurants in town can offer. Everything is decorated in red, white, black and wood, so it is nice and classic, yet with a little raw twist, so nobody doubts, that you are in a steakhouse with style (eg. Hangs a skull on the wall – with a fine chandelier right in front). We were lucky enough to sit on the semi-open terrace, which could be closed off, if it was cold (or too hot) – really a nice gadget that many of the restaurants in Antalya has embraced. Pretty impressive, they had a drying cabinet with the meat right in front of the guests, so you can look at the piece you want to eat. A pretty good service I think. All their meat hangs and matures in atleast 28 days – something that helps provide that extra juice and flavor. 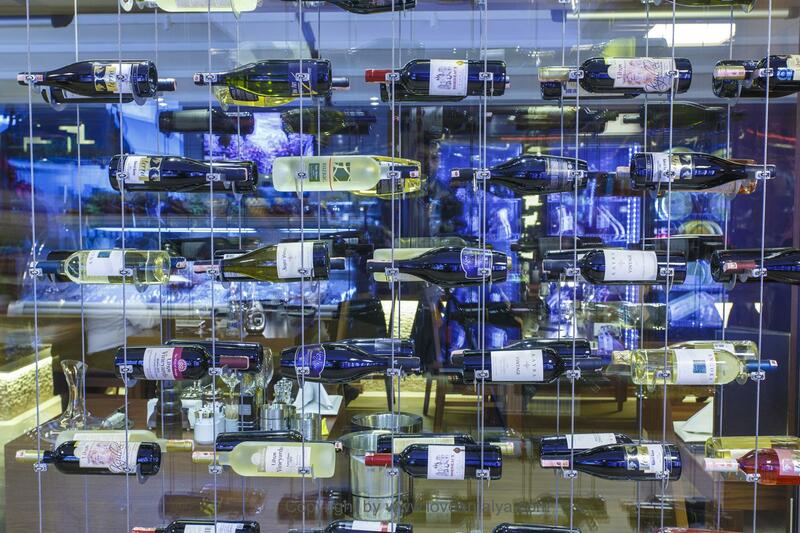 Likewise with the wine, it hungs artfully in a decorative wire system, so everything was on display. Something that helped to create comfort and atmosphere. 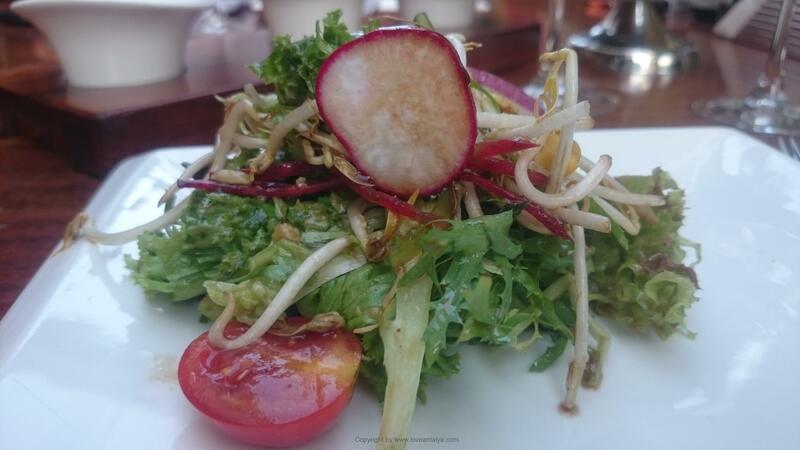 We got the most delicious mixed salad for starters with a small piece of toasted bread with fresh tomatoes. Half-filled as we were already, it was overwhelming with french fries, sauce, garnish and delicious, delicious steaks that came in. The steaks were just as they should be and so tender, that I think, that you could cut through them with eyelashes. 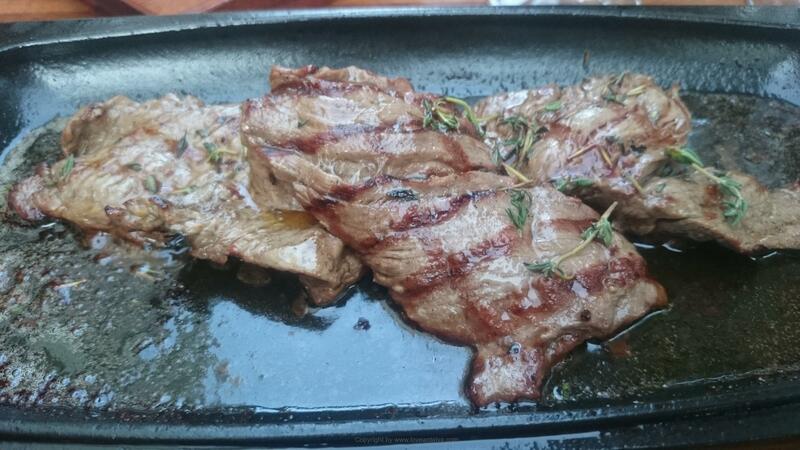 There’s just something about a freshly grilled steak, served on a sizzling hot cast iron plate. And accompaniments was spot on and classic, but with a small Turkish twist. The only serious minus was the sauce, that from my perspective, was made of powder from Knorr. SO sad and dull compared to everything else (we unfortunately did not get the courage to tell them – they were so nice and service minded, so we didn’t have the heart). 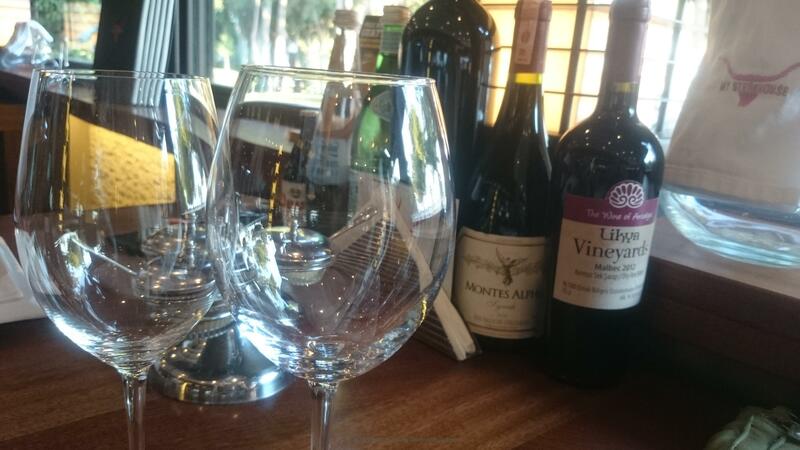 But hold on there was much to choose from – delicious soups, salads, carpaccio, bread, cheese, meat-sushi (!! Yes what you say ..?) Steaks in different cuts, countless side-dishes with accessories such as baked potatoes, spinach, corn, onions, mushrooms, burgers of all kinds and delicious pastries, chocolate and tiramisu. It was a difficult task to choose. Now, if you are really forward-looking, you take a taxi back and forth, the wine was d.e.l.i.c.i.o.u.s (and not that expensive). And we even just had a glass of the house wine. There were SO many to choose from, but I can particularly recommend the local Turkish wines – they are really starting to kick through and fit just perfectly. So remember, if you like wine and are having a good night out. We were – again – very surprised, when we got the bill. We figured that it would be about 72 £ for everything. But it was just a little more than 48 for 2 x starters, steaks, 3 sidedishes, wine, beer, coffee and tea. That’s been a good deal for a restaurant of this quality. It Denmark it would be 3 times the price. Next time we surely bring the kids with us- they would love to get a really good burger with everything. My Steakhouse is at the opposite side of the town from Konyaalti, where we usually stay. But it’s not difficult. The road facing Lara Beach belongs to one of Antalya’s upperside neighborhoods, so there are many fine buildings and a good view, when driving on the outskirts of the city. This side of the town is raised about 30 meters above the sea, so the view is absolutely fantastic. Although it might sound as if this is post is bought and paid for, I assure you, that is not the case. I’m just super excited to finally have found something new in town, I have been screaming for for many, many years. And I really hope that you can use my recommendation. It is a wonderful place …. See more on My Steakhouse own website.